Lernsys Homeschooling Academic Video Courses. 5th Grade Math Video Course With Worksheets, Answer Keys, Tests and More! 1 Welcome to this 5th grade math course! Welcome to 5th grade math! Learn more about ME, Dawn Pensack, as well as what you'll learn in this fifth grade course! In this lesson, review the place value chart. In this lesson, students will receive the answers and explanations for the Lesson 1 worksheet. In this lesson, students will read and write numbers to 100,000. In this lesson, students receive the answers and explanations for the Lesson 2 worksheet. In this lesson, students write a number in standard form, word form, expanded form, and unit form. In this lesson, students receive the answers and explanations for the Lesson 3 worksheet. In this lesson, students will compare and order multi-digit whole numbers. In this lesson, students will receive the answers and explanations for the Lesson 4 worksheet. In this lesson, students use a vertical number line to round multi-digit whole numbers. In this lesson, students receive the answers and explanations for the Lesson 5 worksheet. In this lesson, students add and subtract multi-digit whole numbers. In this lesson, students will receive the answers and explanations for the Lesson 6 worksheet. In this lesson, students discover the patterns in the Place Value Chart when a number is multiplied or divided by 10 or a power of 10 (10,100,1000...). They notice how the digits in a number shift to the left if the number is being multiplied by 10,100,1000 and the digits in a number shift to the right if the number is being divided by 10,100,1000. They also notice what happens with the placement of the decimal. In this lesson, students will receive the answers and explanations for the Lesson 7 worksheet. In this lesson, students discover the relationship between the number of zeros in a number when it is multiplied by 10 or a power of 10 (10,100,1000...). They also notice how the placement of the decimal changes when a number is divided by 10 or a power of 10 (10,100,1000...). Students build on thier understanding from the previous lesson when they used the Place Value Chart to actually shift the digits a specific number to the right and left as they multipled or divided by 10, 100, 1000. In this lesson, students will receive the answers and explanations for the Lesson 8 worksheet. In this lesson, students multiply multi-digit whole numbers. In this lesson, students will receive the answers and explanations for the Lesson 9 worksheet. In this lesson, students will divide multi-digit whole numbers. In this lesson, students will receive the answers and explanations for the Lesson 10 worksheet. In this lesson, students write decimals in word form, standard form, and expanded form. In this lesson, students will compare decimals to the thousandths place. In this lesson, students will receive the answers and explanations for the Lesson 2 worksheet. In this lesson, students will be rounding decimals to the nearest one, tenth, and hundredth place. In this lesson, students will be multiplying decimals. In this lesson, students receive the answers and explanations for the Lesson 4 worksheet. In this lesson, students will divide decimals. In this lesson, students will learn about and compare unit fractions. In this lesson, students receive the answers and explanations for the Lesson 1 worksheet. In this lesson, students will rename fractions in different ways and will understand equivalent fractions. In this lesson, students will subtract a fraction from a whole number and will also become familiar with the benchmark fractions. In this lesson, students will receive the answers and explanations for the Lesson 3 worksheet. In this lesson, students add and subtract fractions. In this lesson students add and subtract fractions with like and unlike units. In this lesson, students will receive the answers and explanations for the Lesson 5 worksheet. In this lesson, students add and subtract fractions in word problems. In this lesson, students will see how fractions are related to division problems. In this lesson, students find the value of different parts of a whole. In this lesson, students multiply a unit fraction by a unit fraction. In this lesson, students multiply a unit fraction by a non-unit fraction. In this lesson, students multiply a non-unit fraction by a non-unit fraction. In this lesson, students divide a whole number by a unit fraction. In this lesson, students receive the answers and explanations for the Lesson 6 worksheet. In this lesson, students divide a unit fraction by a whole number. In this lesson, students receive the answers and explanations for the Lesson 7 worksheet. In this lesson, students divide a fraction by a fraction. In this lesson, students receive the answers and explanations for the Lesson 8 worksheet. In this lesson, students solve word problems involving multiplying or dividing fractions. In this lesson, students will convert units. In this lesson, students will find the area of squares and rectangles. In this lesson, students will find the perimeter of squares, rectangles, and irregular figures. In this lesson, students identify the ordered pair for different points in the coordinate plane. They also plot various points on the coordinate plane given the ordered pair. In this lesson, students will use different strategies to find the volume of rectangular prisms. Welcome to Unit 6! In this short video, I discuss the importance of connecting with your child through different math activities. I talk about how math can be FUN, creative, and exciting! I also briefly introduce the three activities I will be discussing throughout this unit. Learn about the rules of the game, POISON, and watch a short demonstration. Here is an explanation for the winning strategy for the game Poison. Learn about the rules of the game, JUMP, and watch a short demonstration. Here is an explanation for the winning strategy for the game, JUMP. Learn about the rules of the game, BEAT THE CALCULATOR, and watch a short demonstration. This is the end of unit assessment for Unit 1. This is the end of unit assessment for Unit 2. This is the end of unit assessment for Unit 3. This is the end of unit assessment for Unit 4. This is the end of unit assessment for Unit 5. 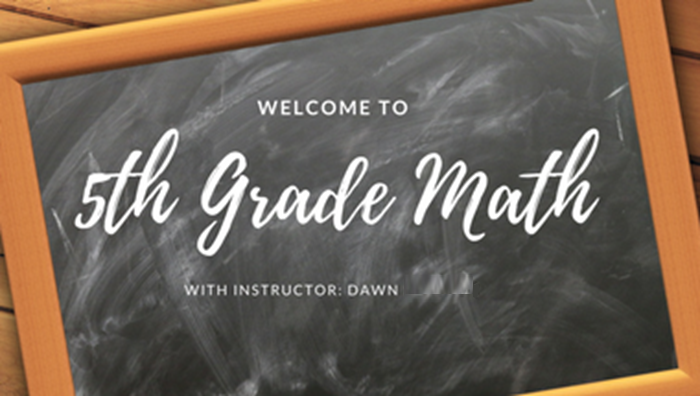 This fifth grade math course focuses on the key areas of fifth grade math with a heavy emphasis on number sense (whole numbers, decimals, and fraction operations). Throughout this course, there are also many opportunities to develop fluency and automaticity with identified key skills, which can be hugely beneficial to the ultimate math success, as students free up mental energy from basic skills to higher-level problem solving. Throughout this course, there is a blend of skill, rigorous application, and a coherent building of difficulty as skills and ideas continue to increase in complexity. There are also models introduced and used throughout this course such as number lines and number bonds, which enables students to SEE the math and why it makes sense. With the numerous ways we learn, this course provides many opportunities for ALL learners to succeed in math and understand the concepts. So, if memorizing a rule and procedure wasn't helpful in the past, this course provides different ways of learning math, and these ways are taught in a simple step-by-step way. The course consists of 34 content rich video-lessons, worksheets, practice review videos, and additional materials and resources. There is also a unit focused on parent connection, since parent involvement and engagement in their child's education makes learning more fun and meaningful. Also, it shows a child the value and importance of school, encouraging them to work hard and persevere in their educational career. And, who doesn't love to have FUN with those they love, right? The activities chosen in this unit were handpicked after working with hundreds of upper elementary students so it has been confirmed that these activities are fun ... and challenging! This video-course is primarily intended for Grade 5 students, Grade 4 students who are ready for an extra challenge and who have mastered Grade 4 math content, and Grade 6 students who could benefit from additional practice in the major focus areas of Grade 5 mathematics. What are the requirements for this Course? Students enrolled in this course should demonstrate proficiency in most of the major focus areas of the Grade 4 math curriculum. What Topics are Covered in this Course? Writing a Number in Standard Form, Word Form, Expanded Form, and Unit Form. Interests: Hiking with my family, playing with my kids, reading (especially listening to audiobooks! ), riding my horse, and educating people about how to use EFT (Emotional Freedom Techniques)to manage their emotions. Issues I care about: Emotional health, helping veterans adapt to civilian life after service, using animals in the healing journey, high quality math education for ALL, and teacher training & stress management to improve teacher retention and overall happiness. Hi! As a child who didn't really enjoy the traditional way of learning math, it was interesting that I chose to become a math educator when the time came in my life to 'choose my path', especially after graduating with a B.S. in Finance! As a math educator for over a decade and then a curriculum writer, I learned so many new and exciting ways to do math where it actually DOES make sense and... is actually FUN to learn! Now, I am so excited to teach math in a way where children see beyond the 'rules' and start looking at numbers with a new perspective, meaning, and recognize that there are so many different ways to learn and be 'good' at math. More importantly, I strive to show children that THEY can develop into outstanding mathematicians. This is the answer key for the Unit 1 End of Unit Assessment. This is the answer key for the Unit 2 End of Unit Assessment. This is the answer key for the Unit 3 End of Unit Assessment. This is the answer key for the Unit 4 End of Unit Assessment. Copyright © 2019 Lernsys Homeschooling and Academic Course Videos. All rights reserved.